Myopia Control (nearsightedness control) is a clinical practice in which a doctor attempts to halt or slow down the progression of myopia in a child or adolescent. Myopia progression is thought to occur because of factors such as genetics and time spent doing near work versus outdoor activities. Currently, myopia progression and new cases of myopia in children are at an all time high, due to the amount of near and computer work required of children in the modern age. Dr. Shrayman are well-versed and experienced in a variety of clinical methods that can be used to control myopia, and have participated in research and written articles on Myopia Control. If you have questions on Myopia Control for your child, do not hesitate to contact us! 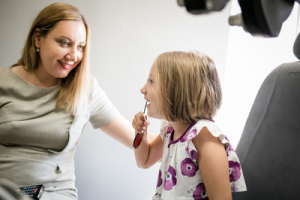 We are happy to set up a consultation with you and your child to explore the best options for Myopia Control. Also ask us about helping you and your children avoid computer eyestrain!